His patriotism was borne out of his pride in Armenia’s strength and victories and he had come to give Armenia everything he had, without expecting to receive anything in return. Garo Kahkejian was born on March 24, 1962, in Aleppo, Syria, to Hayk and Anahit Kahkejian. He was the grandson of Sahak Aslan, the bodyguard of General Dro. 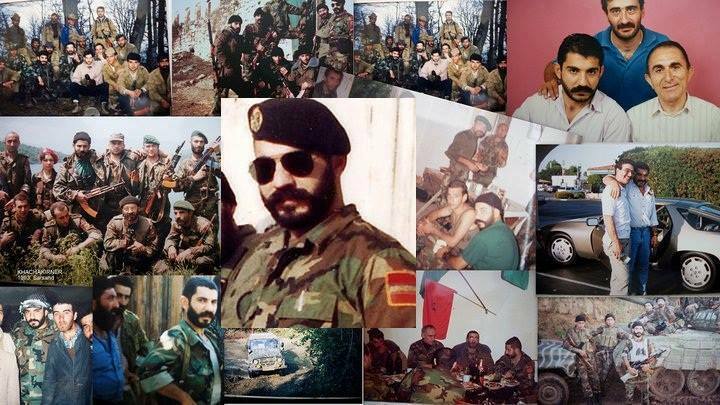 Sahak Aslan was from Cilicia, where he had defended his homes against Turks until the very last possible moment. Eight decades later, as a famed commander in Artsakh, his grandson would go on to enter every battle wearing his grandfather’s kerchief and crucifix. From a young age, the lessons which had been passed to Hayk from Sahak were instilled in Garo. He was taught that an Armenian must always be ready to defend his home. Therefore, as his family moved to Lebanon, despite only being a teenager, Garo decided to pick up arms to defend the Armenian neighborhoods when the Lebanese Civil War started. Garo was a member of the Armenian Revolutionary Federation defense units as well as the Justice Commandos of the Armenian Genocide. Eventually he moved to Nigeria, and then Frankfurt, where Garo would earn his second university degree, in mechanical engineering, from the Frankfurt Engineering University. Finally he settled in Fresno, California. In Fresno, the intelligent and studious Garo, who spoke eight languages, became very successful. He owned a large property, horses and sports cars. However, despite never having stepped foot in it, the only thing that seemed to matter to him was his homeland. Not a single Armenian event took place in Fresno without the knowledge and participation of Garo. In California, it was through him that Arnold Schwarzenegger, his very good friend, learned about the Armenian people and the Armenian national struggle. Schwarzenegger would later write letters to Garo in Artsakh, and would meet up with Garo when he would visit California during ceasefires, and would express his strong desire to visit Artsakh. As the Soviet Union began to crumble, the door began to open for direct involvement with Armenia. When the Spitak Earthquake hit, Garo played a leading role in collecting supplies to send to victims. When he was finally allowed a visa to Armenia in 1991, he travelled with his wife Maro, and took supplies with him that he planned to take to the earthquake zone. However his plans changed quickly after their arrival. As they were walking on Sayat Nova, they noticed a UAZ van full of young men in camouflage. He stopped the car and asked them where they were headed, to which they responded that they were heading to defend Noyemberyan. He immediately joined them. There he finally understood what was happening on Armenian soil, and what must be done. His wife Maro objected and condemned his decision to join active fighting. She said that they had come to go to the Spitak earthquake zone, not to the frontline. At that moment, Garo took off his ring, gave it to his wife, and said from now on I am married only to my country. This was occurring while Armenia was still a part of the Soviet Union. And as the Soviet Visa on his American passport was about to expire, Garo Kahkejian returned to America to prepare for the coming war. There, he did not waste any time. 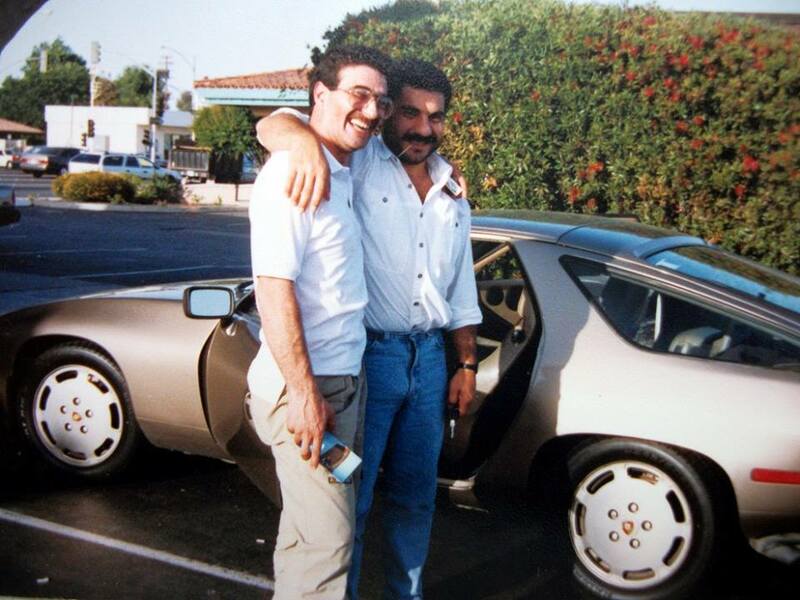 He immediately met his best friend and ideological brother Shahe Adjemian, and they began preparing to return to Artsakh with a military detachment. He gathered a group of patriotic friends, showed them his videos of what was taking place in Noyemberyan, and said it was their duty to join their brothers in defense of the motherland. 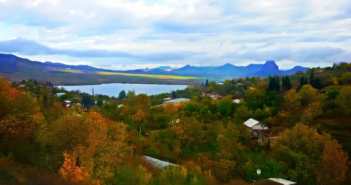 Garo and Shahe decided they would take all of the material aid that they could with them, and then decide what to do next upon arriving in Armenia. It was April 1992 when they finally departed. 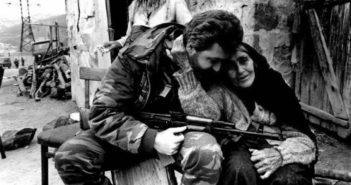 The Soviet Union had collapsed, the winter break was over, and the Artsakh skirmishes had developed into full scale war. On the plane to Yerevan, Garo met Archbishop Parkev Martirosyan of Artsakh, where he explained his plans and programs. Garo and Shahe showed Archbishop Martirosyan paperwork which they had received from the Fresno Armenian Church, which claimed that they were church aid workers, headed to Artsakh to deliver humanitarian aid. Realizing this was a cover, the Archbishop asked them to reveal their true intentions, offering to help them in the process. Upon landing, the Archbishop took them directly to Erebuni Military Airport, put them on a plane to Stepanakert, and handed them a letter that they were to deliver to General Arkady “Komandos” Ter-Tadevosyan. From that day on, the Archbishop became Garo’s spiritual guide, adviser, and confidant. In Artsakh, Garo studied the situation, and got familiar with the challenges, and military realities. Then he returned to America, to sell everything he owned, in order to be able to form and arm his own military detachment. Garo was a devout Christian and for him, Armenia and Christianity were inseparable. He thought only with devout spiritual understanding could the Armenian people achieve the victory they sought. For this reason, he chose to name his detachment the Crusaders. Garo personally selected and approved the members of the Crusaders. For him, the most important quality was an intellectual and a spiritual understanding of nationalist ideology. 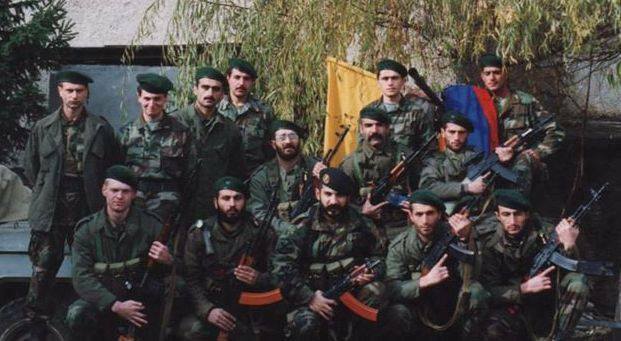 The detachment consisted of only twenty men, however, it was so impressive in its discipline that it was given a special forces detachment status by the Artsakh Defense Committee. It received its religious blessing and guidance by the Archbishop himself. 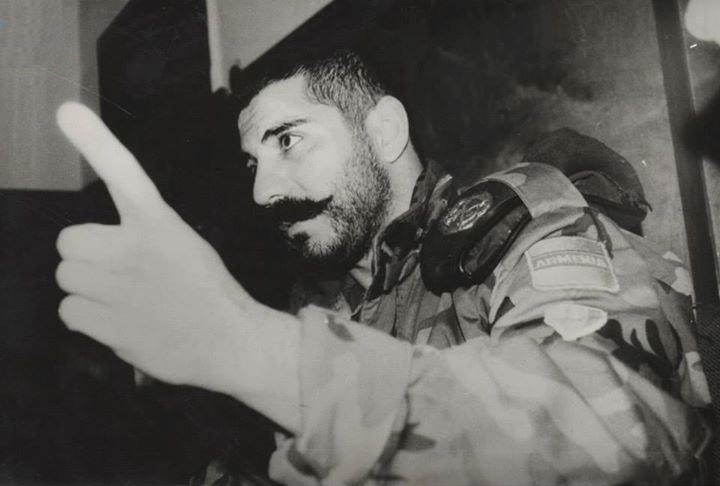 Garo dreamed of achieving a unified, non-partisan, and disciplined national army, and believing that one should lead by example, he sought to instill these values in his detachment. He ensured that his detachment was free of even the most harmless leisures and vices like eating sunflower seeds or chewing gum while in uniform. 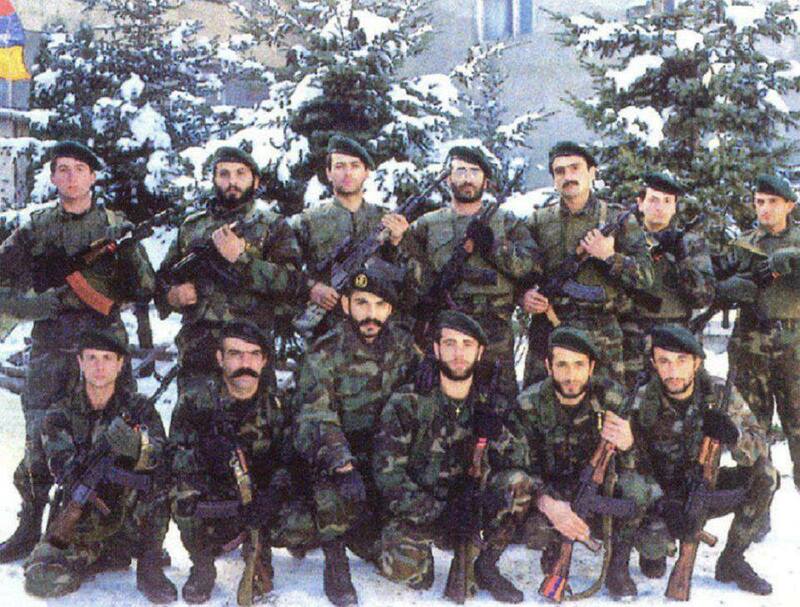 Due to the strict discipline and ideology that he enforced, Garo’s battalion was entrusted with the Artsakh Defense Committee’s most important behind enemy lines military, intelligence, and sabotage operations. One of the Crusaders’ most important achievements in their early months came in the summer of 1992. At a time when the Azerbaijanis was advancing across the length of the frontline, Garo’s detachment was able to achieve victory, beating them back from within their own territory near Karvachar, and preventing the enemy from regaining the Berdzor (Lachin) Corridor, which would have suffocated Artsakh. Many of these seemingly impossible operations that changed the early course of the war, operations which remain largely secret to this day, were executed with only two to four soldiers. Upon victory in the Berdzor Corridor, from June to August 1992, the Crusaders joined the defense of Chldran and Vank, near Gandzarsar, where they astonished both Armenians as well as enemy soldiers in their ferocity and discipline. In their finally and decisive operation, greatly outnumbered and outarmed, they forced the Azerbaijanis to retreat while leaving behind over twenty bodies, and more importantly, four tanks in working condition. The Crusaders did not lose any men, only suffering two light injuries. There, beyond his fighting capabilities, Garo became known in the conflict for his leadership and strategizing abilities. Describing the discipline of the Crusaders during those operations, Colonel Artur Poghosyan said that that was the first time in his life that he had seen a leader order his men forward in an open field, with the enemy under forest cover, where every man stood and attacked, without any hesitation. His soldiers said such bravery was possible because Garo did not say attack, but asked to be followed. They said it never occurred to them that they could die in battle because in front of them always stood Garo. During temporary ceasefires and the winter break, Garo would rush to the United States, in the attempt to educate and organize the Diaspora regarding the war, and to collect donations for armament. Following the start of the spring fighting, after fighting elsewhere, the Crusaders once again received the most important mission when it came time for the all important liberation of Martakert, which had been overrun during the previous summer. They were to covertly infiltrate enemy lines and capture enemy high-ground in order to allow the regular forces to advance. The capture of the high-ground had previously been attempted three times by regular forces which numbered up to 150 soldiers. Every time it had resulted in casualties, defeat, and retreat. This had been a task that had seemed unlikely even for a battalion to accomplish. However, the attack did not come. And as dawn broke, from their second line, the enemy soldiers realized that what had felt like the attack of a large detachment was actually only a handful of men. Shocked at what had transpired, they stopped their retreat, and attempted to salvage their humiliating loss. They began an assault on the high-ground, where after fierce resistance, on June 26 of 1993, the White Bear, as he was known to his men, finally fell. In spite of the loss of their leader, the Crusaders did not cede the high-ground. They fought until finally the belated Armenian offensive came to relieve them. Three hours later, the Armenians took Martakert; forty-eight abandoned Azerbaijani bodies were recovered at the site. The Crusaders carried on, united, despite the fall of Garo. They fought until the very last battle of the war, in the name and honor of Garo, until victory was achieved. 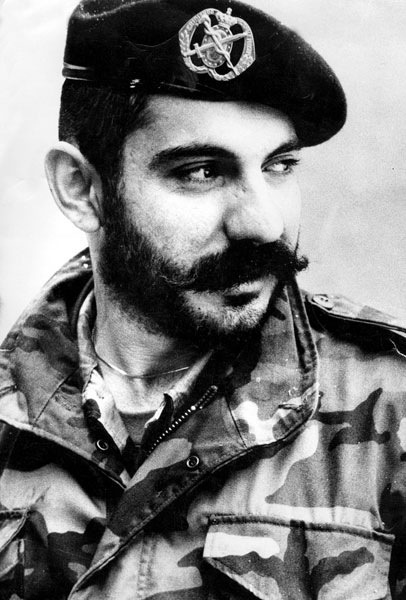 Garo would often say that he would never die, that he would live eternally, through the sacred soil of Artsakh. He was best known for repeatedly saying “my political party is my people.” He did not distinguish between Armenia proper and Artsakh, and he did not recognize any political divisions. He only believed in the sacred Armenian Highlands. He did not come to Armenia to become a hero, but to help return the sacred heroic honor to the Armenian Highlands. He was 31 years old. 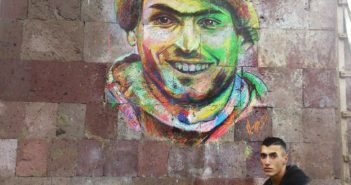 Kudos to The Armenite for this article: hopefully writing about heroes of the Artsakh War of Survival and Liberation will become a tradition at TheArmenite. It is amazing that Kahkejian and his group accomplished so much with only about 20 men. I was always under the impression that Garo had 200-300 men under his command, given their battlefield reputation during the war.